A Little Springtime in a Cookie! Our garden club held a board meeting recently in a member’s home that had all of us whistling springtime tunes as we left even though snow is still knee high in New Hampshire. You see, she added little spring with the goodies she and her co-host served. We are always well-fed at these meetings. Nothing like quiche… both crab AND vegetable… breakfast breads, blueberry muffins (local blueberries! ), fruit, drinks…..
…. but the pièce de résistance was the host’s cookie that got us all excited for spring. At first glance, the basket appeared to be full of seed packets for members to take home, but, no, these were actual cookies…. 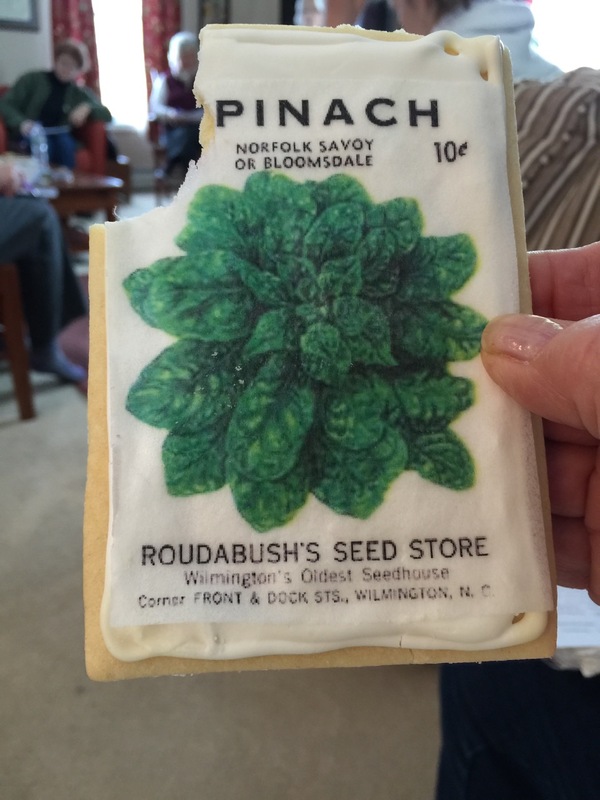 ….Vintage Seed Packet Sugar Cookies! Have you ever seen anything so cute? Yes, these are edible sugar cookies with a thin seed packet wafer of potato starch, veggie oil, and water ‘glued’ over the top. She made the cookies and ordered the seed packets on the web from a company named Fancy Flours. The recipe for the cookie and icing, the cookie cutter, and a host of wafers for every holiday or occasion in a multitude of colors can be found on the website. Check it out. And, yes, they were melt-in-your-mouth yummy. 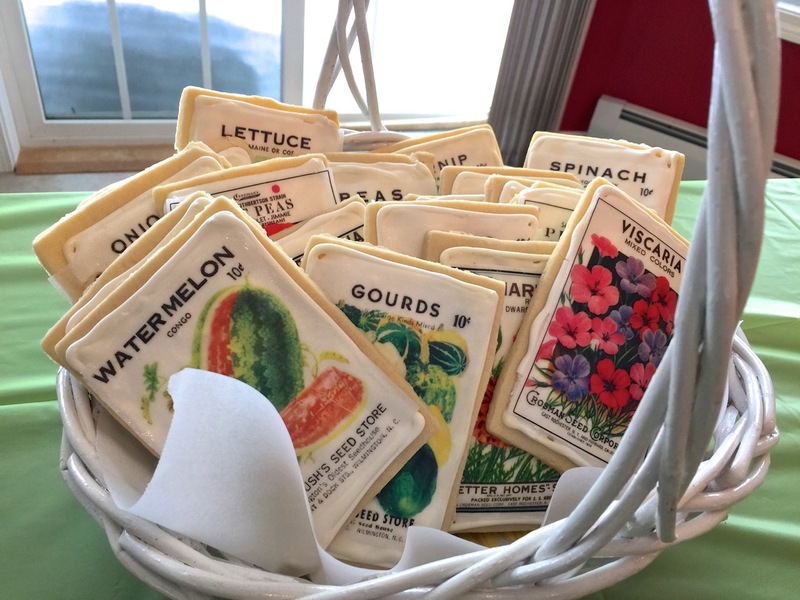 This entry was posted in garden club, spring, vintage seed packet cookies by Annie. Bookmark the permalink. Years ago I made sugar cookies with photos made of rice paper on top of the royal icing. This sounds similar, and it looks absolutely beautiful and delicious. What a meeting! I’m not much for baking except for holidays but I do appreciate other cooks and their culinary skills… especially mister gardener who handles all the grocery shopping and cooking in this home. If I was throwing a baby shower or a themed gathering, I’d certainly use this company for inspiration! It’d be great to serve a smaller cookie with the ‘paper’ at your grand opening! Thanks Annie, I have called to see if they will do any wholesaling. I love the idea! I couldn’t boil water….but this is so neat it makes me want to bake! Fabulous! I’m glad you’re inspired.